Hair Dye Brands There are 332 products. Bored to death of your current hair color? Looking for a bit of a change up? Then you need to check out Herman’s Amazing Hair Color, one of the finest hair dye producers around. Their products are bursting with benefits, making them an ideal choice for first-time dyers and colored hair veterans alike, so whether you’re after a deep blue, a ruby red or even a granny gray, make sure to check out Herman’s awesome range of products. 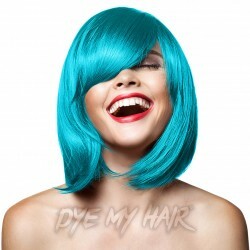 Dye My Hair is one of the top Herman's Hair Dye UK retailers, meaning there's no better place to shop for this awesome brand. So if you're ready to take the plunge and get the bright and beautiful hair color you've always dreamed of, read on. Herman's Amazing Patsy Purple - Looking for a shade of purple that just oozes with personality? Then we've got a perfect choice. Whether you've always been a purple person at heart or just want a hair color with a bit of attitude to it, Pasty Purple is a fantastic choice. Marge Blue - With a name inspired by one of the most well-known blue gals around, you know that this is one hair dye that's going to be a success. If you want a hair color that's guaranteed to really turn some heads, then, well, this is the perfect option. Herman's Amazing Rosie Gold – This fun peachy color is inspired by the rose gold craze. If you would like a hint of orange but aren’t ready for a full head of neon hair then this is a slightly subtler alternative. Gilda Granny Gray - If you want to put to bed the much too prevalent idea that gray is a 'dull' and 'boring' hair color, then we suggest you pick up this sumptuous shade. Gilda Granny Gray is definitely a hair color worth dyeing for. As we said, the choice of colors is almost endless. There’s also Tammy Turquoise, Mathilda Granny Gray and Bella Blue, just to mention a few. If you’re bored of your plain brown, blonde or black hair, why not give one of Herman’s professional dyes a go? Why Choose Herman’s Amazing Hair Color UK? Long Lasting. When you pick up a semi-permanent hair dye, you want it to last you a little while, right? Well, luckily Herman's hair dyes are able to last up to 12 washes, meaning that you can enjoy your lusciously colored locks for plenty of time. Also, these dyes can color your hair in as little as 15 minutes as long as you follow Herman’s hair color instructions? So you can get your hair color quickly too. 100% Vegan and Cruelty-Free. With Herman's dyes, you can feel safe in the knowledge that no animals were harmed. Ammonia Free. Another thing these products are free from is ammonia, which means you also don't have to worry about your hair getting damaged. Keeping your hair healthy is incredibly important and Herman's helps you do that. Re-sealable Tubs. This may seem like a pretty small point, but trust us when we say it's a great feature. Now there's never any need to throw away any unused hair dye, with leftovers lasting up to 12 months. This is the perfect solution to keeping your roots and color topped up and looking fresh. Another thing we believe is worth noting about Herman’s Amazing Direct Hair Color is the brand’s awesome bleach kits. The 30 Vol. 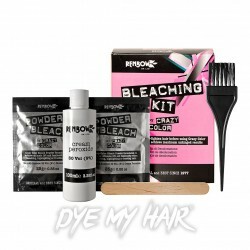 Bleach Kit will help make sure that your new hair color comes out bold, removing any natural shades that might affect your new color. Don’t just take our word for it; check out the Herman’s Amazing Hair Color reviews. So what are you waiting for? If you’re eager to shake up your hair color and create a new look, you need to try Herman’s Amazing Hair Color at least once. They'll give you bold color like you’ve never seen before, keeping you and your hair looking vibrant and healthy. Get creative and get yourself a totally awesome new hair color today! Are you seeking a funky new way to switch up your look? Are you tired of showcasing the same look? If so, then Stargazer hair dye is the brand for you! Boasting high quality, vibrancy, and a lengthy duration, you’ll sure be stuck for choice when it comes to picking your perfect color! Established in 1978, Stargazer started its days as a single stall at the Great Gear Market located on Kings Road in London. The central hub of punk fashion and culture at the time, it’s due to this movement that the range of Stargazer hair dye offers such quirky, outrageous, and alternatively colored products! Eventually expanding into department stores by 1980, Stargazer prides itself in producing the vast majority of their products ‘in-house’, ensuring the highest quality possible is delivered to their customers. 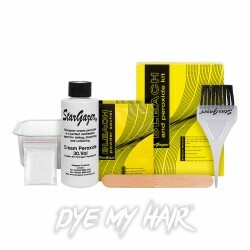 Now a firm favourite worldwide, it’s time you checked out our extensive range of Stargazer semi permanent hair dye products available here at Dye My Hair. Enjoy the potential for creative genius with Stargazer hair dye! Here at Dye My Hair we pride ourselves on offering an extensive range of Stargazer products. From hair chalk to hair mascara and from Stargazer semi-permanent hair dye to UV hair gel, Stargazer has your every need covered, whatever the occasion and whatever your budget! Whatever shade you’re after, make it a memorable one with Stargazer! With an extensive range of bold and diverse colors available, there surely is something for everyone. Offering more than just Blue, Orange or Purple hair dye, Stargazer prides itself on producing unusual and vibrant colors that are enough to satisfy even the most veteran of hair dyers! Blue: If you’re a sucker for all things blue, then Stargazer blue hair dye has just the shade you need! 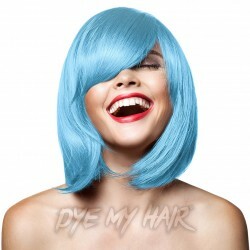 Offering tones such as ‘Azure’, ‘Coral’, ‘Royal’ and even ‘UV Turquoise’ you can kiss goodbye to those one-shade wonders! It’s time to embrace your new style with the help of Stargazer! Red: If you thought Red was just one shade, you couldn’t be any more wrong! From ‘Rouge Red’ to ‘Golden Flame’, it’s time you set fire to your looks and keep your style burning all day/night long with Stargazer! A welcomed change from your natural shade, going Red with Stargazer couldn’t be any easier! 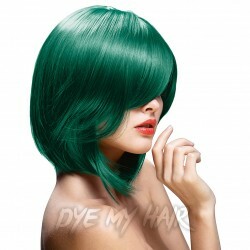 Green: Gone are the days of being green with envy over, now you too can achieve that hairstyle you’ve always dreamt of achieving. With luxurious tones such as ‘Tropical’ and ‘Stargazer African Green’, your look needn’t ever be the same again! Silver: One of the best hair colors to start trending in recent years is silver. With the use of Stargazer silver hair dye and a little bit of bleach and toner; it’s easy to say goodbye to your old uninspiring look and create a whole new you! Ideal for all natural hair shades, Stargazer offers its customers the perfect chance to explore their individual style with color! From subtle and delicate pinks to show-stopping and statement worthy yellows, Stargazer is the perfect choice for those new to hair dye as well as those looking to broaden their dyeing horizons! When it comes to using Stargazer hair products, as with any other brand of hair dye, we highly recommend that you maintain in keeping your hair in tip-top condition, in order to achieve the highest quality finish. Stargazer solutions are renowned for being both peroxide and ammonia free, ensuring your hair is treated the best way possible! Here at Dye My Hair we understand how important hair care truly is, so we take great pride in providing our customers with products that are of the highest standard. Furthermore, ALL Stargazer products are free from animal testing making them a delight for vegans – what more could you asks for? Free From Animal Testing – All Stargazer hair dye products are certified as being free from animal cruelty. This ensures that they are tested and ethically produced. Ammonia Free - Ammonia is a compound gas that is known to break through and damage both hair follicles and hair shafts. Despite lengthening the duration of a hair dye, it, unfortunately, can alter the quality of the dye, making it dry and often brittle. As Stargazer hair color is manufactured without any ammonia, you can rest assured that your hair will remain looking as luscious as possible! Peroxide Free – Hair dyes that contain this chemical compound can often be very damaging to your hair. Acting with a corrosive effect, this most often leaves hair weakened and feeling brittle. As Stargazer dye products are 100% peroxide free, your hair is set to look gorgeous whatever the occasion! Take pride if perfecting your look with Stargazer hair dye! With a wide selection of quirky and luminescent colors to choose from, it’s time to embrace the exploration of color and style! Ensuring your hair is kept well cared for; Stargazer products are here to take you on a whistle-stop tour of style freedom! Boasting a whopping single application coverage that’s sure to last up to 6 weeks there’s no stopping your style with Stargazer! With a range of Stargazer hair chalk to soothe those last minute re-vamps and a broad selection of UV hair gels for those well-anticipated all-nighters, you’ll never want to go back to au naturel after you’ve dabbled with Stargazer. Here at Dye My Hair we’ve got exactly what you need. With the help of the vast selection of Stargazer hair dye range we’re able to cater to all your ‘dyeing’ needs! With lightening kits to help you on your way to colored exploration, now is the time to rock your look in style with Stargazers extensive collection of wild, radiant, and stimulating tones! 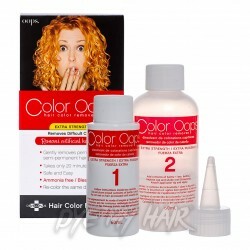 Make sure your new hair color comes out bright and bold by using Herman's Amazing Bleach Kit beforehand! We know that each brand will work differently for each person. You may love Crazy Color while your friend swears by La Riche Directions which is why we have made sure to give you the widest range of hair dye brands to choose from. The results and overall appearance of a hair color will depend on many different variants. From your natural complexion to your hair type, you may find some colors complement your style better than others. It may even be a case of finding the perfect tone for you, which is why you are sure to need plenty of choices when it comes to your hair color product. We have put together this hair dye brands list to help you find the perfect hair match. Each brand excels in different areas but all are sure to provide you will excellent results. There are so many people trying to find best professional hair color to cover gray but true hair fashionistas know now is the time to embrace gray tones! For example, Manic Panic Blue Steel is super popular. This gray color has blue undertones creating a chic pastel style hue. Finding the best hair color for grayhair styles is easy when you shop with Dye My Hair. Proudly use the ‘granny gray’ hashtag on social media and show the world your new tone. Another of our favourite neutral tones from Manic Panic is the Manic Panic Virgin Snow hair dye but don’t be fooled by these light colors. 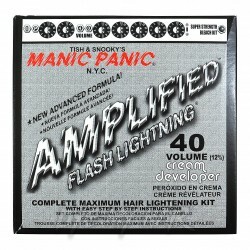 Manic Panic also offers a huge range of bright and UV hair colors! Are you worried about damaging your hair when you apply color? Not all of us like the thought of adding chemicals to our locks which is why we also stock the best hair color without ammonia. Herman’s amazing hair colur is one example of a brand that takes the ethical side of hair color very seriously. As well as being ammonia free, their products are vegan friendly and aren’t tested on animals. If you were to ask us which is the best professional hair color brand we simply couldn’t choose between all the products we stock. Everything we sell is carefully selected to ensure you get the best and brightest colors on the market. When it comes to the best hair dye for black hair we think it all depends on how you prepare your hair. We stock plenty of toners and bleach kits to help you achieve a lighter base color before you begin applying your final product. Stargazer, alongside their bright Stargazer hair dyes, offers different hues of toner depending on which color you are trying to neutralise so be sure to do your research before you buy! 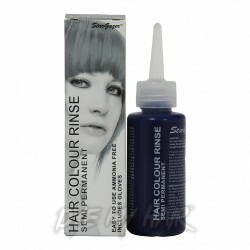 Crazy Color hair dye and Splat hair dye have a huge rainbow of colors but in particular have a glorious range of blue and purple colors. Browse through the blue section and you are sure to feel like you are scrolling through a gorgeous tropical ocean of color. From temporary hair chalks to semi-permanent products, don’t settle for second best when you can find exactly what you are looking for at Dye My Hair. Paintglow is champion brand for festival looks. With their ranges of Paintglow cosmetics and hair products, they certainly live by “the brighter the better”. Check out their awesome UV range for the best in party styles. Alternatively you can enjoy a vibrant head of hair when you apply the Paintglow rebellious colors hair dye to your locks. These are just some of the highlights for the looks you can achieve with these brands. With a massive selection of ranges within each brand, experimenting with different products is the only way to get a true idea of which color is best for you. If you are going to dye your hair remember to patch test your product first. This enables you to see the color results before you commit to a full head of new locks and also allows you to test that you are not allergic to the dye. We are so confident with our choice of products that we believe these are hair dye brands professional. If you need more inspiration for hair colors and styles then why not check out our blog and social media channels. We post something new on a daily basis so you are sure to find something to spark your creative interest! We even post about the hair dye brands we stock so you can keep up with the latest products and information.